I have held physical silver and gold investments continuously for 5 years, and on and off before that. Today I cashed out of silver, trading it for an equal dollar value of gold. For the sake of full disclosure, my physical precious metals holdings are now entirely at GoldMoney and I have an affiliate relationship with them. As a result of that relationship, I will likely be back in silver soon, but in small amounts, and hopefully at decreasing prices. 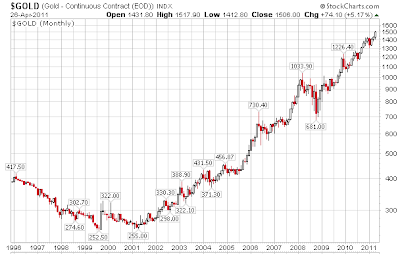 If silver crashes, I will consider switching a considerable percentage of my gold for an equal dollar value of silver. This is not a top call. I have no idea how high silver will go. No one else does either. I came close to cashing out near $30 but figured I would ride out a correction to low to mid $20's. That correction never came. 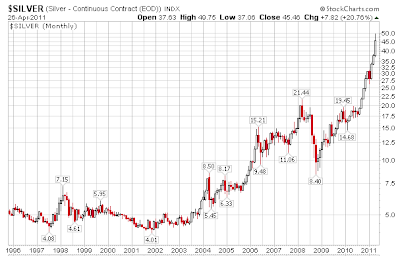 However, one thing I have learned is parabolic moves seldom end well. Please consider the following charts. 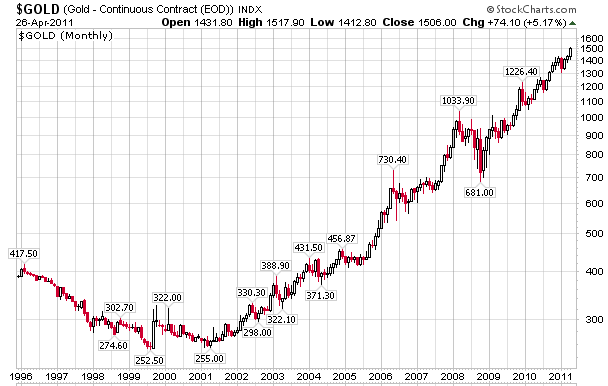 The advance in gold has been steady and orderly. 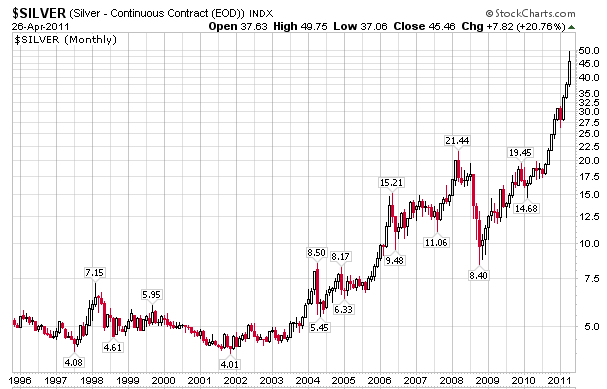 In contrast, the advance in silver has been anything but orderly. Parabolic spikes in anything typically retrace a significant part of the move, sometimes all of it. Note the spike in silver from $4 to $8.50 retraced all the way back to $5.45 and the spike from $5.45 to $21.40 retraced all the way back to $8.40. Given the unstable nature of parabolic and hyperbolic spikes, I believe the price of silver is highly likely to revisit the low $20's at some point. Thus, I see no point in chasing silver higher here. Moreover, except for pure speculation, I see little reason to even hold silver in this spike. Both gold and silver seem susceptible to a pullback, but especially silver because of the unstable nature of its advance. For now, I will take my chances with gold.